I never thought of Lands' End as my style, but I really did see some wearable pieces in the Lands' End Canvas Fall/Winter collection. The Lands' End Canvas collection embodies classic American style with a twist. The palette is made up of indigo blues and accents of red and pink, grounded in khaki and denim. Key pieces that are great for layering include the 2x2 rib tank, poplin shirt and the fine gauge v-neck - and these pieces come in XXS! Denim comes in several fit and wash options with a focus on the pencil jean this season. I am all about the dark wash so I am definitely liking the rinsed blue indigo and I need at least one gray was in my wardrobe. I love this canvas bag with the thick strap! 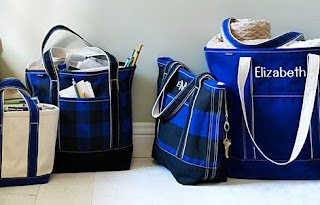 Lands' End Canvas has a great black plaid newspaper bag and different colored newspaper totes, with a long strap to wear over-the-shoulder. Check out these chunky knit pillows and throws from Lands' End Home. They look pretty cozy comfortable and stylish. They also carry cashmere blend throws. Also great for the home are these open or zip top canvas totes. 24 oz. cotton canvas does not mildew and has double needle stitching for strength. These totes have the ability to stand up without tipping over. So go ahead - fill them with towels, throws or magazines. They are great for storing things around the home!